Doncaster Knights will cross swords with Hartpury College for the first time in tomorrow’s Championship clash at the Gillman’s Ground (2.30pm). Even though promoted Hartpury are still finding their feet at Championship level, director of rugby Clive Griffiths is predicting a tough battle for his high-flying side after doing his homework on them. 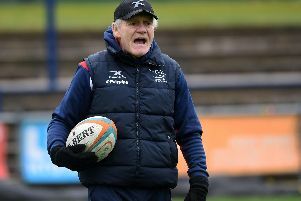 “They’ve made a good start to life at Championship level and I think it will be a tougher game than at London Scottish at the weekend,” said the Welshman. “They’ve recruited well (after winning last season’s National League One title) and they’ve got a lot of players that we know. Although Hartpury, who have strong links to Gloucester, have only won one and drawn one of their opening five Championship games, they have led at half time in all but last Friday’s narrow defeat against Nottingham at Lady Bay. Skipper Rhys Oakley, a former Welsh international, suffered a head injury during the game and is set to miss out tomorrow. Despite a tough start to the campaign, which has seen them play relegated Bristol and two of last season’s top five, no team has managed to pick up a try bonus point against them. Griffiths was expected to run the rule over several players before finalising his squad today ahead of what will be the club’s last league game before the start of the B&I Cup group stages. “If we can go into the two B&I Cup games having won five of our first six Championship games then that would be a good position to be in,” he said.